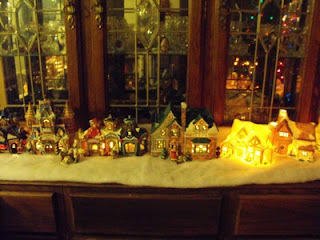 My gift for you today is the pictures of my tree and village. 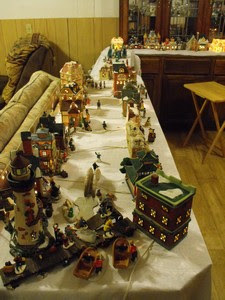 The village is no where any way how I want it but at least I got to unpack it and play this year. I had 2 stores and the Mayor's Mansion I couldn't fit in. Next year I'll have a full 4x8 sheet of plywood to actually construct side streets, put up the gazebo and large center-of-town Christmas tree. A few things were broken but E6000 glue is wonderful stuff. I didn't think when I bought the lights last year that I'd purchased solid color strings instead of multi-colored and how interesting it would be trying to put them on the tree. I still managed to wrap each individual limbs but I have vertical rows of color. It's still pretty. Then there's the village. This isn't the best shot of the village but the only way to get it all in. I have 2 book stores, quilt shop, pie shop, Dollar General, pub, Duffy's Tavern, Chinese restaurant, Lighthouse and pub, 2 toy stores (one is musical), school, church, train depot, Guns and Ammo shop and a Mountain View Lumber. We found the lumber store at Menards in Peoria the year we bought the house. Had to have it because we'd been purchasing remodeling items from Mountain View Lumber in our nearest main shopping town - Mountain View MO. waits to check the list. 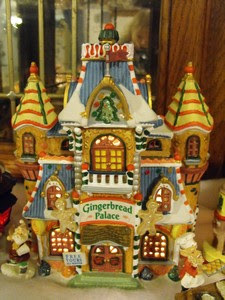 Mrs. Claus directs the activities from Gingerbread Headquarters and elves spend hours in the Confectionery baking yummy treats to fill the stockings. I hope you'll come back next year to see how the village expands. On Holiday Hiatus... sort of. How is everyone doing? Are you ready for Christmas? I'm done shopping. Now if I were just done decorating. I was talking to a blogger friend a few minutes ago and realized why I'm dragging my feet with this tree. I really don't like change. This is the first year for this tree in this house, new lights, new placement. I'm having to refigure everything and it's just sucking the creativity right out of me like an ornamental vampire. Well, despite the fact I've been up since 4 a.m. (no clue why) and really want a nap, I'm determined the lights are going on this tree today. Thus, no card posting. If I break for one more thing, this tree will be a dark albatross in the middle of the dining room till time to pack it away. 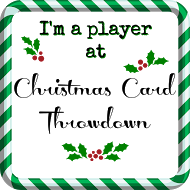 Other than the tree and final decorations, I'm not planning on any other postings the last two weeks of this year. 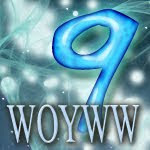 I want to get things in line so I can be ready to stay consistent with my postings beginning with the new year. I have to say, that with the holidays approaching, the Amazon sellers I've been dealing with lately have been... FABULOUS! I ordered 2 books and a DVD last week. Everything arrived this week. The first item was a book that is part of a trilogy. I'd been unable to find the book locally so ordered it. I want to read it then share the entire collection with a friend as a Christmas gift. She doesn't mind 'used gifts'. We're good that way. LOL The DVD was to replace my husband's VHS of the John Travolta movie classic, Pulp Fiction. Sorry, I don't see the appeal of this particular movie but hubby likes it and has been searching for a replacement for months. If it will make him smile, that's good enough for me. The third item I ordered was The ART JOURNAL WORKSHOP by Traci Bunkers. It comes with a Live Time-Lapse Video of the projects being created. Pretty cool. I know... I don't NEED another art journal workshop book but I love looking at different takes on the same techniques. Every artist brings their own vision to the table. Now when you order from someone on Amazon, it's a good thing to notice the SELLER RATING. Ideally, you want to work with someone who has 4-Star or higher, or 98% Success rate. HOWLING FOREVER BOOKS has a 5-STAR rating. And with good reason. The art journal book was well packaged - maybe too well. 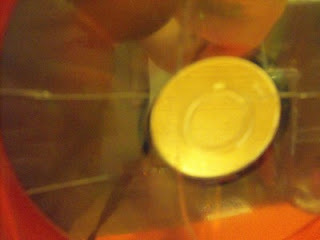 It had been packaged so tightly - within bubble wrap, mind you, that the CD in the inside front cover cracked. The first thing I did was take a picture of the cracked CD, still in the plastic sleeve inside the book cover. Then I emailed the seller at amazon, explaining that although I had already given them a 5-star rating I have since noticed the broken CD. When I checked mail the very nex morning I had a response from Howling Forever (via Amazon) and they had already refunded my purchase price. The felt the CD was an integral part of the book and wanted me to have the funds to purchase a new copy of the book locally that would have a workable CD. Wow! They didn't ask for the book back (that would probably cost more in postage than it was worth). They simply said Merry Christmas! Granted, it wasn't their fault the USPS has to stomp on our packages, but Alex and his team did the right thing! And that's all the counts. I will work with Howling Forever Books and I hope when you're shopping at Amazon, you'll check their store front and know what you're ordering will be handled with professionalism. Now.. to make time to play with Traci's book! For you mixed media artists, I encourage you to check out Lisa Vollrath's site at Ten Two Studios . For just about every holiday, Lisa offers up some of her favorite images for download. The catch... to get them free, she only releases one per day for the duration of the offer. Her images are always vintage and beautiful to work with. Her Christmas images began December 1st. So you can go in now and download each one up to present. Just remember to check back every day until Christmas to get them all! The first challenge was to create a card based on what gives us Warm Fuzzies during the holidays. We could take the 'warm fuzzies' literal and go with furry pets, warm gloves, etc. Or whatever gives us that 'comfortable' feeling. For me, Christmas is my baking season.Nothing says comfort like great smells from the kitchen. Growing up, my (step) mom introduced me to baking around the age of 9. I fell in love with the kitchen and have been baking/ cooking ever since. I don't bake a lot during the year because if I did, Bob and I would weigh a ton x3 between us. We like our home baked goodies and know if they're in the house, they're going to be eaten. So instead, I save my massive baking for the holidays when I can divide it all into treat boxes for friends and businesses who've served us well throughout the year. Since our daughter's favorite cookie is my gingerbread men, I pulled out my Martha Stewart Gingerbread set from Christmas 2009, along with the coordinating paper. Then I went to one of the many Christmas issued stamping magazines packing my shelf. 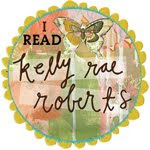 I chose the December 2007 issue of Scrap and Stamp Arts. I found a simple, yet great card from artist Grace Tolman called Merry Christmas. Sometimes a card is fine the way it is. The layout, right down to the pierced scalloped edge is the same with three exceptions. 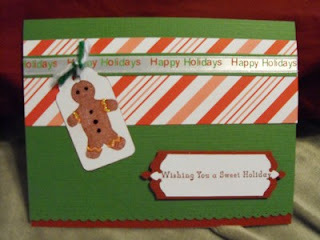 Grace's tag was more centered on the card front, bearing a Christmas tree withe the saying Merry Christmas, her candy stripe paper also had shades of green and she used white ribbon where I used green and white yarn. I chose to separate the two. I stamped the gingerbread man on the tag and scooted the tag to the left. This left room for the sentiment on a separate tag on the bottom. I used SU Garden Green and Cherry Cobbler CS. I decorated my gingerbread man with gold stickles and a black glaze pen. Ten of my family/ friends will receive this card for Christmas next year. Maybe you'll be one of them! Yep, I'm one of THOSE people. At least that's what a lady in JoAnn's Fabric accused me of one day (several years ago). I was purchasing fabric for Halloween curtains for my kitchen. She asked what I was going to use it for. When I told her she said 'Oh, you're one of those people'. LOL Okay.. If one of those people is the type of person who loves to decorate for the holidays and make my curtains coordinate with everything else in the room, than I plead guilty- with pleasure. As I said yesterday, I've determined it all relates back to color. I love colored lights - or tons of lights in general (like looking out over a city from the 16th floor of a hotel), colors portrayed in fabrics, ornaments, embellishments. 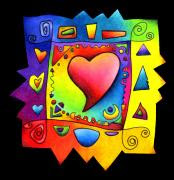 Just give me color and I'm a happy girl. If I were one of those people (sorry, no offense intended - just couldn't resist), I'd have Color My World playing on here to greet you every time you visited. 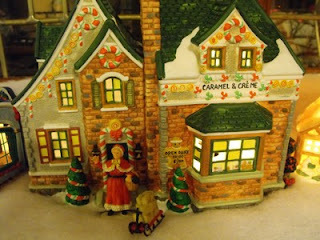 I began decorating with the gingerbread theme in my kitchen several years ago. It started with this adorable fabric I found by Marcus Textiles. I can't remember for sure but I think it was suppose to be for a tree skirt. I saw valance. At the time I had 2 very wide windows and the fabric called to me. I wound up not only making valances but also an apron. Coordinating fabrics in the line were the images you'll see on the table centerpiece and the fabric covering the canisters. 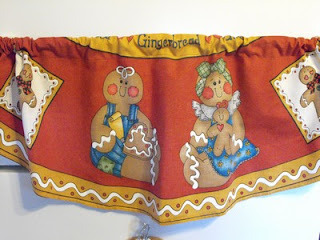 There was the all-over gingerbread baking images as well as panel fabrics with the small gingerbread boy/ girl/ heart and the larger image I've turned into pot holders. Little by little I've added other things to the kitchen but this is the first year I've been able to bring it all together. 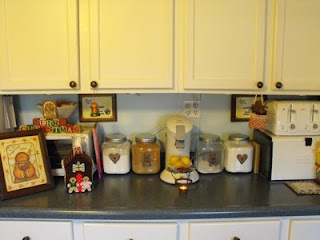 In fact, I spent yesterday making the canister covers, pot holders, condiment basket liner and the embellishments for the front of the glass jar canisters. So let's take a walk around my kitchen. Our dining room table normally doesn't sit in the kitchen. When I show you the Christmas tree on Sunday, you'll understand why it's in here for a few weeks. 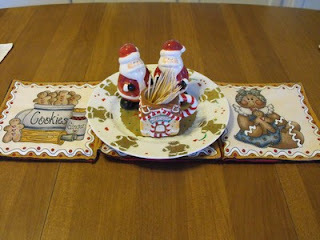 I made place mats and the hot pads yesterday to dress it up a bit. I painted the little plate several years ago for a county fair entry. This picture is of my favorite 'alcove'. The counter gets totally cleared off when I do my Christmas baking. It is my rolling / cutting station. The baking supplies are in the cabinets above, measuring spoons/ cups, parchment paper and baking-only spices in the drawers. The cabinets below house all of my jumbo mixing bowls, cooling racks and baking pans as well as my prized kitchen aid mixer. I have puck lights underneath the upper cabinets for a nice work-light. My other favorite spot to be is at the stove. I love to cook and bake. 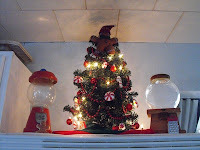 The microwave oven is a bit high for me but it makes a nice display shelf for my candy jars and the little peppermint candy tree. 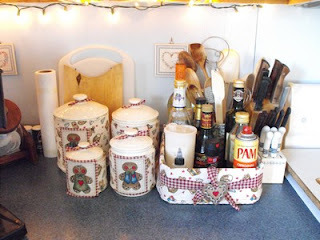 To the left are the canisters and the condiment basket. A picture of the 'naked canister' is below so you can see how just a little time and fabric can really change the appearance. Of course, I was designing the pattern yesterday so it took awhile. But now that I have that part done, I can see these covered for other holidays as well. 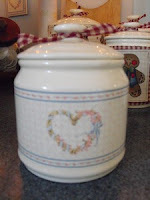 The condiment basket is a pint canning jar box! I like being able to move the entire box of bottles to clean rather than shifting them one at a time. It will also help keep the counter clean of drips. I can just remove the liner and toss it in the laundry. Yep, definitely making more of these! 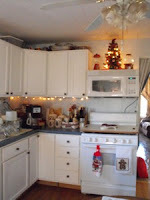 Because I have yet to get hubby to install the puck lights under these cabinets, I ran a 20-light string of Christmas lights to brighten the corner. What's left in here? Eventually I'd like to make chair pad covers for the chairs and add woven/ braided/ or crocheted rag rugs in a deep brick red and hunter green. I have a hunter green/ white checkered fabric already cut into rolls of long strips. I'm on the hunt for a solid brick red of the same weight so that might take awhile. 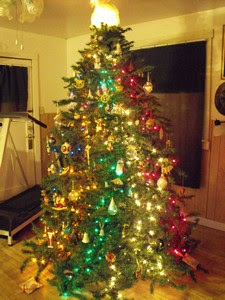 I'm taking tomorrow off the blog to work on the dining room and the Christmas tree. I'll be away to a writers meeting on Saturday. So my hope is to have pics of the tree/ dining room for you on Sunday. After that, the only thing left for this year is my village. My poor houses/ stores haven't seen the light of day in over five years. I've missed them. Just not sure where they're going to go. LOL But I'll have Sunday, Monday and Tuesday to figure it out while you look at cards. I LOVE to decorate for Christmas. And this year I finally figured out why. Yeah, it's a lot of work but it all reverts back to my love of color. Colored lights, colored ornaments, shapes, sizes, textures... Decorating is an ART! My favorite room in this house is my bathroom. The kitchen comes a close second and I'll share it tomorrow. I finally got the bathroom I've always wanted. Linen storage, a nice vanity, a big window for light and fresh air and a bubble tub. The wall board we used is a creamy white with what looks like brush strokes of color in a sea foam green. But if you put blues with it, then you get more of a bluish tone than a green from the sea foam. So for Christmas I went with powder blues, white, snowmen and snowflakes. With the linen closets flanking the vanity and a huge mirror to fill the space, I went simple accents. You can't see them actually in the picture but hanging from the light fixture at the top of the mirror, there are three of these snowballs spaced evenly across. The center snowball hangs a bit lower than the 2 outside. 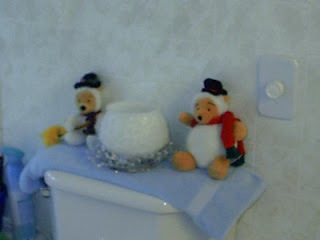 I still want to make a snowman cover for the hand soap pump. 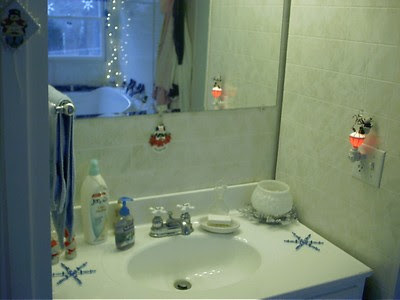 The snowball candle holder in the top right of the vanity and again on the back of the potty is actually an antique glass potting jar. It's textured like a snowball. I've placed a jar vanilla candle in each one. I also collect Pooh Bear... well, bears in general.. but these two Pooh Bears from the Disney store dressed as snowmen found their way in here. I didn't even think about placement when I put them on the potty tank. Honest! And then there's my favorite spot in the whole room. The BUBBLE TUB! I've surrounded it with snowmen. 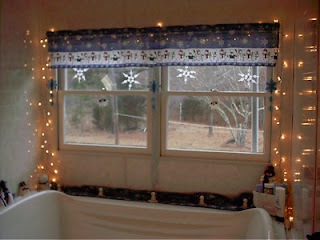 The white lights hanging down either side of the window also work as a place to hang beaded icicle ornaments. All of the beaded snowflakes and icicle ornaments are from swaps I used to do with a Christmas Notebook group I belong to. 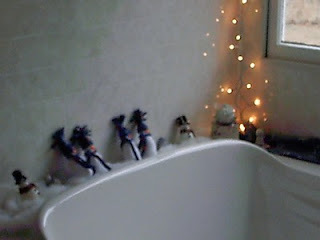 There's still room for more snowmen at the opposite end of the tub and I'm always on the look out on after-Christmas sales. Tomorrow I'll have pictures of my kitchen. The kitchen is all about what else... GINGERBREAD! We're taking the month of December off from destinations, but MotherMark is still giving us challenges to play with if we have the time. You can read about this week's challenge HERE . I used Dasher, minus the antlers (since leopards don't have antlers) and gave him a leopard look. Dasher is stamped in SU Daffodil Delight then the spots are created with Black Perma Marker. Because the teapot is actually a Santa, I gave the base of the card that Santa 'look' by adding a strip of SU Black CS run through a pop can top ring for a belt/ buckle. The corner looked bare so I added the sentiment from SnowGlobe and turned the Vintage Labels punch vertical. A final touch rounding two of the corners on the image mat reflected the 'roundness' of the Jolly man. 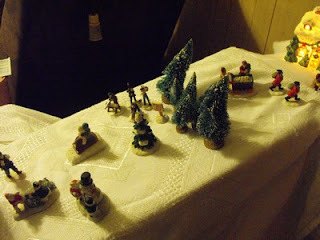 This week, I'm getting a jump on Christmas 2012. 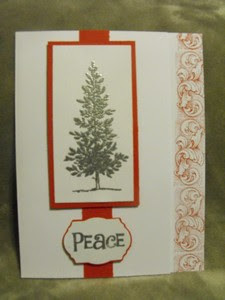 I was part of a Christmas Card Challenge at Splitcoaststampers this year. Aside from pledging to do X-#of Christmas cards every month, I mailed out a prize envelope to one lucky stamper who made their personal goal each month. This year I am co-moderator. My co-conspirator, VikkiJo, works out of town part of the week and doesn't always have internet access. So we decided to team up this year so no one got lost in the daily postings. To set a good example, I'm going to try and have my card posted by the 1st day of the month. I'm still playing in the Volume 4 of Take Ten. The card I chose this week is by Sylvia Yu. I couldn't find a link for her. I hate CASing a card without giving credit back. I can tell you my card is very close to Sylvia's. Sometimes you just like a layout the way it is. Where I used GP White CS, Sylvia chose a pearlescent vanilla CS. 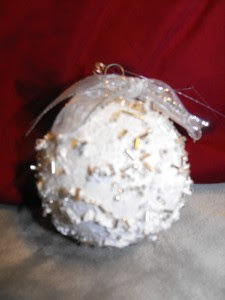 She also used actual ribbon for the vertical strip, and punched small holes in her silver-embossed tree so the 'red balls' would show through when she matted it on the red CS. Her tree and border were from Art Impressions. How is mine different? I used SU Real Red CS and Ink, Lovely As A Tree, and Sculpted Style. I also cut the front flap of the card back 1" and stamped the Sculpted Style border on the right edge of the 'inside' of the card. 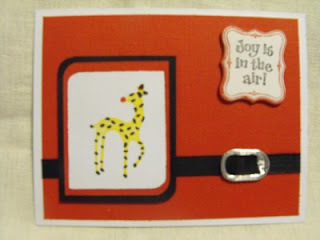 I added the sentiment mat using the Nauveu label shape (Cricut) at 1.25" and the shadow. I added dimension by popping up the tree and sentiment mats. So... 6 cards done for 2012 and 46 to go. Now to get this year's mailed!